Category: Tako (octopus). Season: best in early summer and early winter. Octopodes that are around five pounds in weight are considered the tastiest for sushi - with firm flesh, plenty of umami, and sweet flavors and aroma. Typically, tako is first kneaded for at least thirty minutes to tenderize the flesh, then it is boiled (yudedako) in water to further soften. The final tenderizing step involves gently beating the flesh with the flat part of the knife just before serving. Occasionally, tako will be served raw (namadako) - as pictured above - it must then be sliced very thinly to prevent it from being too chewy. 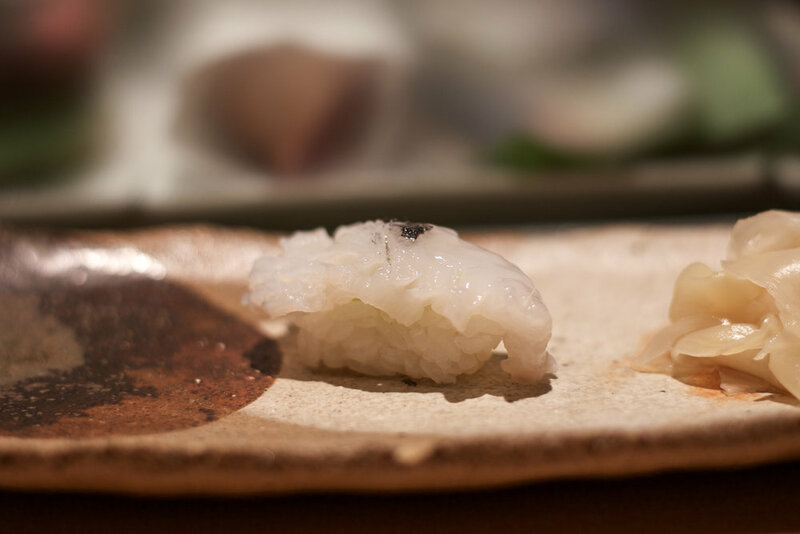 Namadako really brings out the sweetness of the flesh, and is best with a little Okinawa sea salt and a drop of sudachi.